Some of the mountainous areas in North Carolina saw a half of inch of ice. North Carolina Gov. Roy Cooper has declared a state of emergency after a winter storm covered the Midwest in snow over the weekend. The winter storm dumped 10 to 20 inches of snow on parts of Missouri, Iowa and Illinois from Friday into Saturday and moved toward the East Coast on Sunday. By Sunday afternoon, snowfall totals in the Mid-Atlantic region were about 6 inches in Washington, D.C., about 5 inches in Hammonton, New Jersey, and 5.6 inches in Baltimore, according to the National Weather Service. The Maryland State Police received about 775 calls for service statewide between 7 p.m. Saturday and 3 p.m. Sunday, and 197 crashes were reported during that time, the department wrote on Twitter, urging motorists to take extreme precautions. From 7pm last night to 3pm today, @mdsp received 775 calls for service and statewide, 197 crashes were reported. State police urge motorists to take extra precautions while traveling. #DriveDefensively and keep a safe distance between vehicles. Remember wipers on, lights on. There was also freezing rain overnight in the mountains of western North Carolina, which produced a significant amount of ice -- up to half an inch in some areas. The emergency declaration in North Carolina is intended to expedite power restoration in the state after the storm knocked out power to about 98,000 customers, according to a press release from Roy's office. The storm has since moved off the East Coast and is heading out to sea. Roy warned that hazardous conditions are still lingering and black ice will be a concern during the Monday morning commute, especially on Interstate 85. "Though the worst of the storm is over, conditions are still hazardous in areas that saw snow and ice," Cooper said. "If you are without power, please be careful if you are using alternative heat sources." With at least 10.9 inches of snow in St. Louis through early Sunday, this is the biggest snowstorm the city has seen in five years. Heavy snow bands hit parts of the Washington, D.C., metro area, as well parts of Roanoke and Charlottesville, Virginia. Additionally, there was mixed precipitation in western North Carolina on Sunday morning. People across the Midwest and the East Coast lost power, with more than 214,747 people without power Sunday morning in North Carolina, Missouri, Kansas and Virginia. North Carolina was particularly hard hit, with 108,998 people without power, likely due to a mix of freezing rain, sleet and snow that fell overnight. 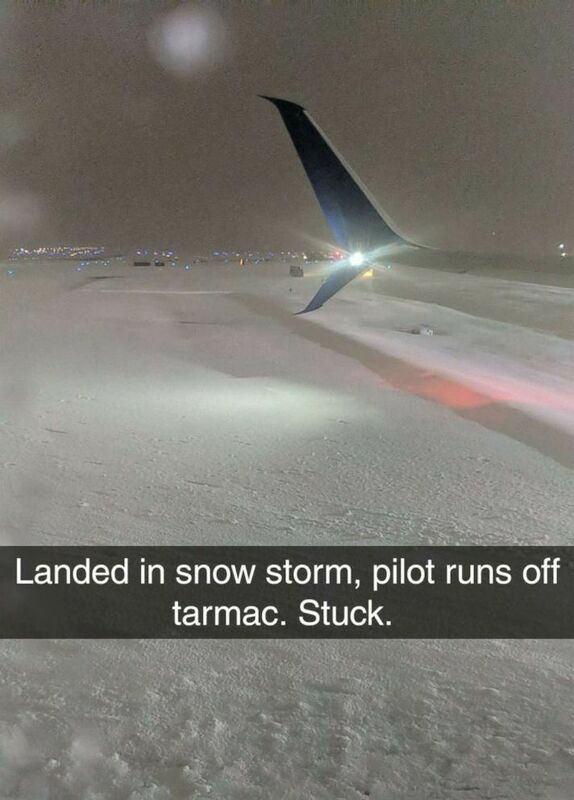 (Brad Ritti/Twitter) Delta passenger Brad Ritti posted a photo to Twitter after the flight he was on slid off the runway, Jan. 13, 2019. A Delta flight from Las Vegas to Cincinnati landed at the Cincinnati/Northern Kentucky International Airport, then slid off the pavement at around 5:30 a.m. Sunday. No injuries were reported and the airport remains open and operational. 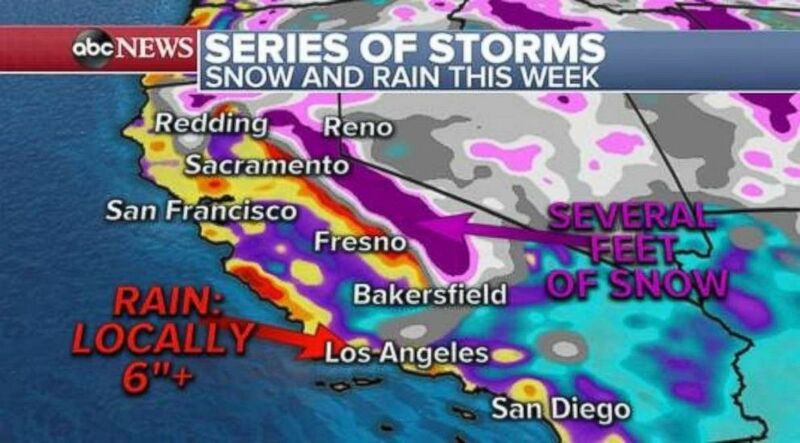 Another storm will arrive in Southern California on Monday and possibly a second on Tuesday. Heavy mountain snow is also expected for the entire Sierra Nevada range and parts of the mountains outside Los Angeles. A winter storm watch has been posted for the Southern California mountains with locally over 1 foot of snow and 60 mph wind gusts possible. (ABC News) Heavy rain in Southern California could cause mudslides this week. ABC News' Julia Jacobo and Amanda Maile contributed to this report.